Crystal Pink Series Pierced Bowl. 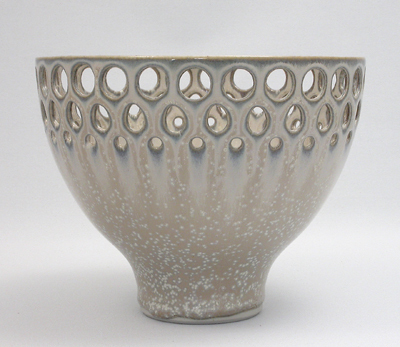 Most of the work I produce is wheel thrown, using a porcelain clay that I make myself. It is fired, in a reducing atmosphere, to cone 9 - 10 (1280 - 1305 centigrade) in a propane gas kiln. Many of the pieces are pierced, cut or textured before glazing. 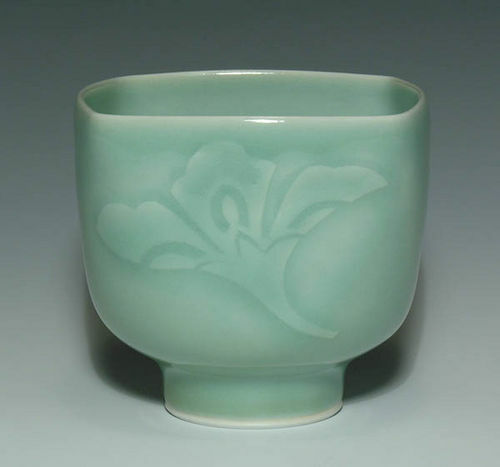 My extensive study and love of Oriental ceramics can be seen in the forms and glazes that I have developed. I also enjoy using low temperature local clays as the base for several of my metallic glazes. Square wheel thrown porcelain bowl. Keraflex imagery applied for relief pattern. High fired in a propane gas kiln in a reducing atmosphere. 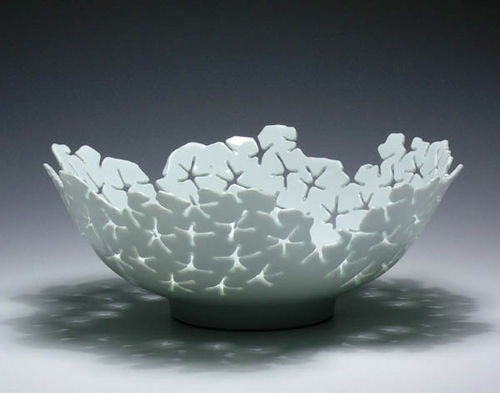 White dremel pierced porcelain bowl. High fired in a propane gas kiln in a reduction atmosphere. Kamloops Series Container. Wheel thrown and textured porcelain. 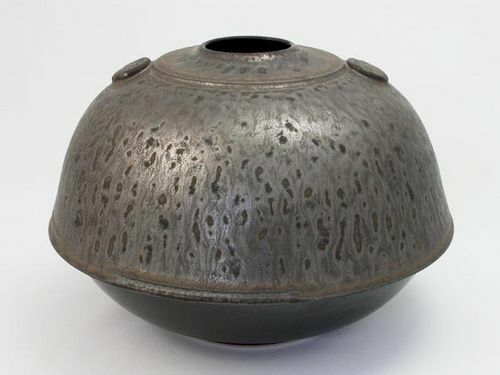 Slip glazed containing mineral oxides. High fired in a propane gas kiln in a reducing atmosphere. Chosin Pottery is owned and operated by award winning, internationally known ceramic artists Robin Hopper and Judi Dyelle. It is located a pleasant 30 minute drive from downtown Victoria, British Columbia, Canada. Situated on six acres, in Metchosin, it houses two studios, a gallery and showroom. The studio is set in the beautiful, two and a half acre, award-winning, Japanese-inspired garden of a renovated heritage house dating from the turn of the century. The grounds contain one of the finest stands of first-growth Douglas fir in the Victoria area. The huge fir trees are underplanted with many large rhododendrons, shrubs, perennials and bulbs, both indigenous and exotic. 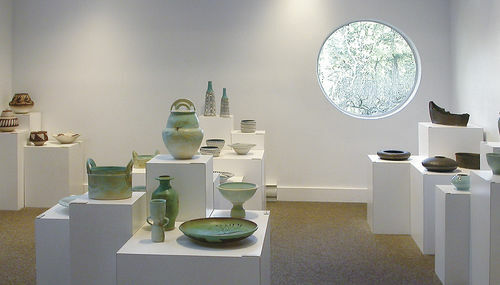 The Gallery, overlooking the water garden, has a continually changing variety of work. Weekends 10am - 5pm Weekdays please call first or by chance.